"You were fabulous! I've never before ENJOYED someone reading their short stories (but you're different)!" "Bursting with energy, exuberance and excitement, this performance has huge emotional swings. Moving, stimulating and often hilarious, Char will have you crossing your legs and wiping your eyes." 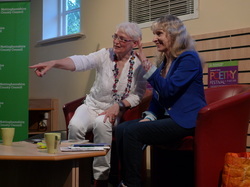 "You were fantastic at Southwell Poetry Festival last night. Funny, sad, moving - just overwhelming. Now I'm sitting on the bus reading the poems!" Contact me to book a performance - and give your audiences a performance they will never forget!